Teams of volunteers will scour the UK’s three highest peaks at the weekend collecting rubbish left behind by this summer’s visitors. They will be taking part in the annual Real 3 Peaks Challenge to tidy up the summits of Ben Nevis, near Fort William in Lochaber, Scafell Pike in the Lake District and Snowdon in north Wales. 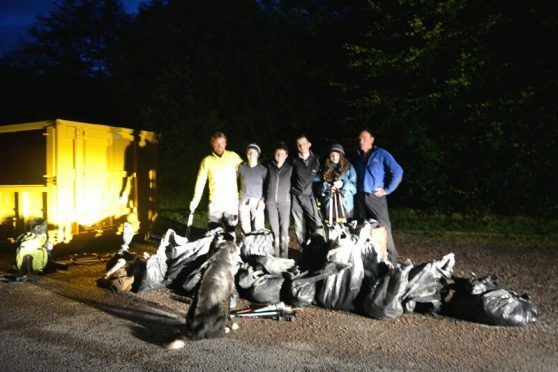 The massive clean-up operation is always carried out on the second Saturday in October. And the man behind the ambitious project is mountain guide and climbing instructor Richard Pyne, of Kinlochleven. Mr Pyne said: “After spending a day with my clients on Ben Nevis, I had a brief look around the summit area and was appalled at the amount of human debris kicking and blowing around. “So, whilst my clients were eating lunch, I bobbed around and filled two carrier bags in as many minutes. “I was pretty unhappy about the state up there, and got a little bee in my bonnet. He explained that he originally intended to tidy all three mountains himself, but realised it was too big a task for one person and enlisted the help of coordinators in England and Wales.